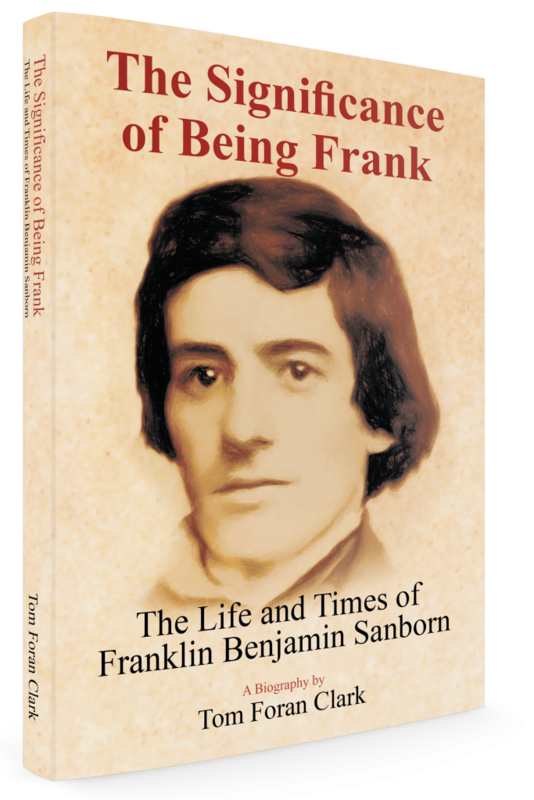 The Significance of Being Frank is an engaging biography! Franklin Benjamin Sanborn was born December 15, 1831 in Hampton Falls, New Hampshire. In 1850, Sanborn studied Greek with a private tutor, then entered Phillips Exeter Academy and, after, entered Harvard, from which he graduated in 1855. Sanborn moved to Concord, Massachusetts, where he taught school. Active in politics as a member of the Free Soil Party in New Hampshire and Massachusetts, in 1856 Sanborn became Secretary of the Massachusetts Kansas Commission, where he came into contact with John Brown. Sanborn was one of “The Secret Six,” who knew in advance of Brown’s impending raid on Harper’s Ferry in October, 1859. On the night of April 3, 1860, five federal marshals from Virginia arrived at Sanborn’s Concord home, handcuffed him, and attempted to wrestle him into a waiting coach in order to take him to Washington, D.C. to answer questions before the Senate regarding his entanglements with John Brown. Some 150 townspeople rushed to his defense. Louisa May Alcott wrote a friend, “Sanborn was nearly kidnapped. Great ferment in town. Annie Whiting immortalized herself by getting into the kidnapper’s carriage so that they could not put the long legged martyr in.” Though Sanborn would disavow his having had any advance knowledge of John Brown’s attack, he would defend Brown’s actions to the end of his life, assisting in the support of his widow and children and making periodic pilgrimages in later years to John Brown’s grave. He would not only write a biography of John Brown, but also of Ralph Waldo Emerson, Henry David Thoreau, Samuel Gridley Howe, and others. From 1863 to 1867 Sanborn was editor of the Boston Commonwealth, from 1867 to 1897 editor of the Journal of Social Science, and from 1868 to 1914 a correspondent of the Springfield Republican. He was associated with the National Conference of Charities, the National Prison Association, the Massachusetts Infant Asylum, and the Clarke School for the Deaf. In 1863, he became Secretary of the Massachusetts State Board of Charities. He was Secretary from 1863 to 1868 and again from 1874 to 1876. In 1865, he was one of the founders of the American Social Science Association and was its Secretary from 1865 to 1897. In 1879 he became State Inspector of Massachusetts Charities under a new board and helped reorganize the entire Charities system, focusing especially on the care of children and insane persons. He served as Chairman until 1888. Sanborn was twice married. In 1854, he married Ariana Walker, who died just eight days later. Sanborn courted the nineteen-year-old daughter of Ralph Waldo Emerson, Edith Emerson, proposing to her in 1861. He was rejected. In 1862, Sanborn married his cousin Louisa Leavitt, who had worked as a schoolteacher at the Concord school Sanborn had founded. They would have three sons. Copyright © 2015. Tom Foran Clark. All rights reserved.